"Know Before You Go!" Off Highway Vehicle Education program. The Arapeen OHV Trail System is located in south central Utah in the Manti-La Sal National Forest. Over 350 miles of ATV and 4X4 routes are included in the system. The backbone of the system is the scenic South Skyline Drive which is a rugged 4X4 experience for most of its 58-mile length from Utah Highway 31 on the north to the Fishlake National Forest boundary on the south. Access to the western side of the trail system occurs from Sanpete Valley and US Highway 89. Principal access points include 4X4 route #4 in Spring City Canyon, ATV route #3 in Manti Canyon, and ATV route #2 in Twelve Mile Canyon east of Mayfield. Access to the eastern side occurs from the communities of Castle Dale and Ferron which are located along Utah Highway 10. Principal access points include ATV route #5 west of Joes Valley Reservoir, ATV route #62 from Ferron Canyon, and 4X4 route #7 also located in Ferron Canyon. ATV routes shown on the Arapeen Trail System map (in green) include sections passable only by ATV’s (vehicles 52” or less in width) along with other sections where ATV’s share the use of Forest roads. ATV routes are also shared by horses, mountain bikes, and hikers so please watch out for other outdoor enthusiasts. 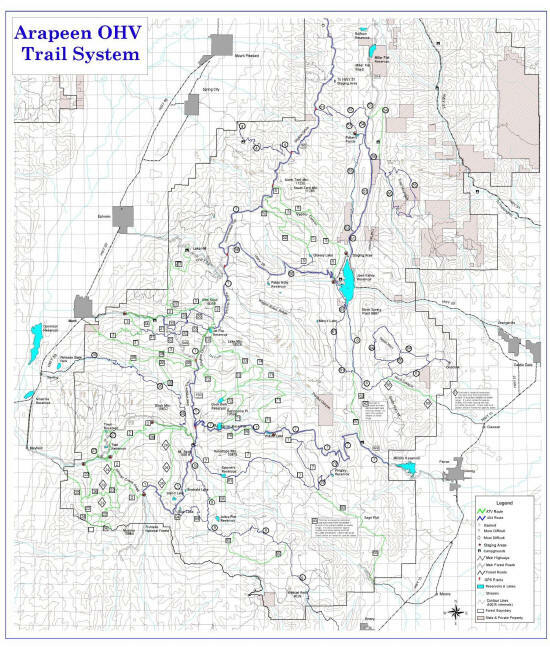 4X4 routes shown on the Arapeen Trail System map (in purple) include sections passable only by high clearance four wheel drives along with other sections that may be graded or graveled roads shared with standard passenger cars. 4X4 routes are also shared by ATV’s. Other Forest roads shown on the Arapeen Trail System map (in black) are open to ATV and 4X4 travel but these are generally dead end routes with no opportunity for a loop experience. All travel on the Forest is restricted to designated roads and trails. The trail system is generally open beginning late-May although trails to high elevation areas may not be accessible until July 1st. Winter snows generally close most trails to use by early November. Individual trails are also periodically closed to protect wildlife on winter range, movement of cattle on and off the Forest, or for maintenance and reconstruction activities. These trails are being developed and maintained for your use and enjoyment through a cooperative effort by the Manti-La Sal National Forest, Utah State Parks and Recreation, Arapeen Trail Council, Goodwill Riders, and many local volunteers. Please recognize that it is a privilege to use this trail system. Familiarize yourself with the signing protocol, ride within your abilities, leave the land better than you found it, and be safe! Send mail to webmaster@atvutah.com with questions or comments about this web site.